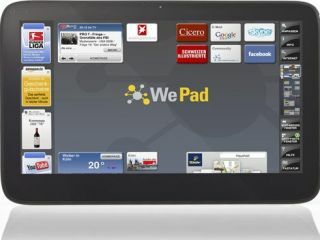 WePad - no I in, erm, We. An 11.6 inch tablet computer that is hoping to take on the Apple iPad has been priced at €449 (£390), with German company Neofonie's WePad using an Atom processor and toting 1Gb of RAM. With the race on to bring a credible Apple iPad rival to market, the likes of joojoo and the WePad are getting column inches, and the latter's pricing will make it an attractive option. Of course, with Apple's tablet already moving smoothly past the one million sales mark before it even gets a global launch, the iPad has already become perhaps the tech launch of the year. But if you object to Apple's walled-garden approach, or are worried about looking like an iSheep, then Neofonie is hoping that it can tempt you away. The WePad certainly looks respectably kitted out on paper; the device boasts an 11.6 inch screen that is larger than the iPad, along with 1GB of memory, 16GB of flash storage and sports two USB ports – that's two more than you'll find on an iPad. It's 800g heavier than its rival, and, as Fudzilla points out, there will be big valid questions about battery life and, crucially, the all-powerful Apple App store, but we look forward to playing with one soon.